Are you passionate about libraries and interested in leadership development? You could be Idaho’s next Emerging Leader! This summer both the Idaho Library Association (ILA) and the American Library Association (ALA) will accept applications for the 2013 ALA Emerging Leaders Program. If chosen as ILA’s representative to the program, you could receive a $1,000 scholarship to participate! The Emerging Leaders (EL) program is a unique opportunity for people who work in libraries to attend two ALA conferences and participate in problem-solving work groups. EL is a leadership development program that enables library staff to work with their peers from across the country on ALA projects. The program is designed for librarians of any age with less than five years of experience or who are under 35 years of age. Upon the completion of the program, participants are encouraged to serve on an ALA division, chapter, or round table committee or workgroup. In 2013, EL’s fifty participants will be awarded grants to attend the Midwinter Meeting (January 25-29) in Seattle, Washington, and the Annual Conference (June 27-July 2) in Chicago, Illinois. The Windy City also happens to be the location of the ALA headquarters. The application for ILA sponsorship will be posted on the ILA website in May with a deadline of June 30. If you are not selected by ILA, you can still apply for sponsorship through ALA groups by August 1. Participants must be an ALA member, and if sponsored by ILA, an ILA member. I have fond memories of my time spent as a 2011 Emerging Leader (EL) in San Diego, California, and New Orleans, Louisiana. The program begins with the opportunity to select a special project to work on with other EL members. Project topics ranged from developing a Money Smart Week website to writing a scholarship marketing plan to designing a webinar learning series to developing a videogame collection. I selected Librarians Build Communities, a volunteer service day for librarians. My team sought ways to expand the ALA program by designing a national project to match skilled librarian-volunteers to volunteer projects in their local community year round. The first EL session began on Friday at the Midwinter Meeting. Facilitators Maureen Sullivan (now 2012-2013 ALA President) and Peter Bromberg (Princeton Public Library Assistant Director) shared their knowledge about ALA governance, principles and practices of effective leadership, and guidelines for successful projects. We then split into teams of five and formulated ideas on how to develop and implement our project. An ALA staff liaison and project mentor also assisted each team with designing the project. After a group photo, we adjourned for a series of networking receptions set in hotels and restaurants. The following three days were spent circulating in a whirlwind of what can only be described as librarian utopia: book hoarding, vendor swag snatching, and tech gadget exploring. 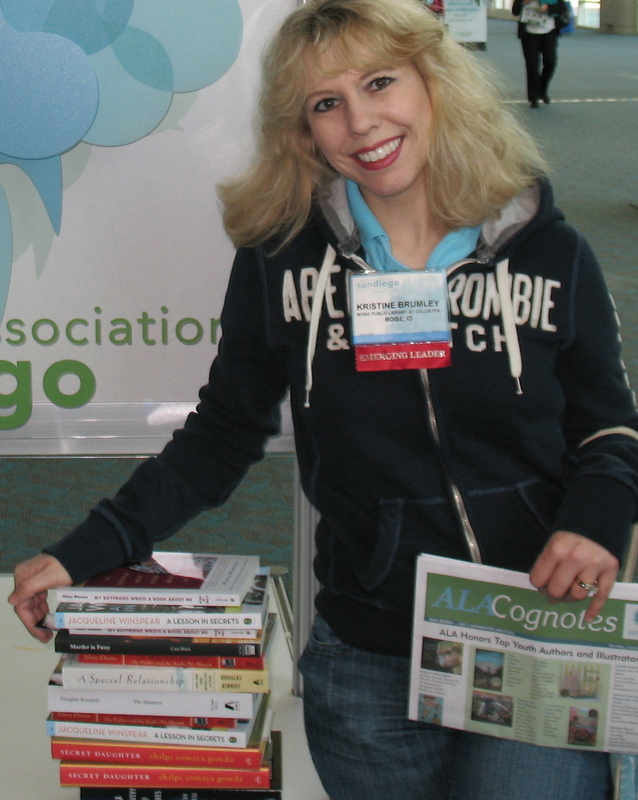 I trekked across the massive convention center in search of author book talks, raffles (and won an iPad! ), and informative sessions on eBook technology, library trends, grant writing, and Wikipedia. The educational lectures, panels, and discussions with seasoned librarians, professionals, and celebrity authors like Neil Gaiman were beyond inspirational. Thereafter, the EL program continued in an online learning and networking environment. My team met up for online chat sessions every 2-4 weeks and shared information using Google docs. We conducted research, interviewed ALA staff and volunteer coordinators and discussed volunteer programs across the country. Then we formulated a plan for the expansion of Librarians Build Communities in our own communities. Six months after the Midwinter Meeting, the Emerging Leaders meet again at the ALA Annual Conference. More than 25,000 registrants, staff, and exhibitors attend the annual conference and there are hundreds of sessions and events to attend. The conference kicked off with a full day of Emerging Leaders sessions: we spent time reviewing and assessing the project experience, while the facilitators discussed lessons learned about effective leadership in associations. To commemorate the successful completion of the program, the facilitators presented certificates and pins to the participants. The program culminated with a poster session and reception extravaganza in which we displayed the results of our projects to conference attendees. What did I take away from my experience as an Emerging Leader? I came away feeling energized and empowered to do more in my own libraries! Now, it is your turn. Are you ready to take the challenge and become an Emerging Leader? If so, I’ll see you in Seattle! For more information about the ALA Emerging Leaders Program please visit: http://www.ala.org/educationcareers/leadership/emergingleaders. For information about ILA sponsorship and application requirements contact Gina Persichini at gina.persichini@libraries.idaho.gov. Kristi Brumley is a Library Assistant at the College of Western Idaho and Boise Public Library at Collister. She will graduate with her MLS from the University of North Texas in May 2012.